Many companies, B2B in particular, depend on LinkedIn for lead generation. According to Hubspot’s “The 2013 State of Inbound Marketing” data, 43% of all marketers have found a customer through LinkedIn. According to LinkedIn’s blog, there were 5.7 billion (yes, billion) searches done in LinkedIn in 2012. The blog announced that LinkedIn had more than 238 million members. To put that into perspective, LinkedIn would have the fifth largest population in the world if it were a country. Numbers like that mean it has a lot of data to search. 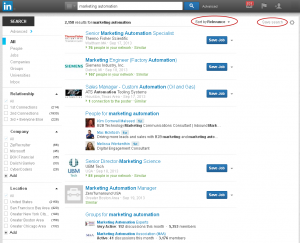 The LinkedIn search box appears at the top of every page ready to search for people, jobs, companies, groups and so on. Join the 43% and boost your chances of finding the right companies, clients and prospects with these LinkedIn search tips to search faster and receive more precise results. Many people and companies have the same terms, which can make it challenging to find the right one. Do a search for “James” and autocomplete displays people, companies, groups and universities with the name. This does come in handy when you need to jog your memory or don’t know the full name. LinkedIn search also uses an algorithm allowing it to learn from your searches to provide more relevant results. “Save search” appears in the right-corner of most results. With this, you can create up to three saved searches (with a free account). It’ll even send you an email alert on a daily, weekly or monthly basis when it finds new matches. The other almost easy to miss feature is the “Sort by” helper in the right-corner to the left of “Save search.” This doesn’t show up in every instance of search, but it lets you sort your search results by relevance, relationship and date. Refer to Figure 1 for both features. Figure 1. Search results page sorted by relevance. 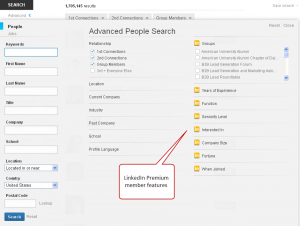 When doing a general search, LinkedIn provides a handful of results from every category. As you can see in the first figure, “marketing automation” displays jobs, people and groups. Whether you loved or hated college, your college connections can be a stepping stone to the next deal. Figure 2. Use LinkedIn Alumni search to find fellow alumni. Once you’ve narrowed your list using the options in Figure 2, you can search the profiles of the remaining connections. Introducing yourself with a “Hey, we went to school together” can be a powerful lead-in. If you’re interested in talking to people in computer software companies, you’ll be dealing with more than 1.6 million computer software companies and millions current and former employees from these companies. Advanced People Search, as Figure 3 shows, sifts through these to find people with specific traits and terms. For example, you can use this to find all the potential CMOs in a Fortune 251 – 500 computer software company within a 60-mile radius. The Advanced People Search form is self-explanatory. Beware that items only LinkedIn Premium members can use the items marked with the orange LinkedIn icon. Yes, even with the many options, it’s possible to improve your results with Boolean search operators. LinkedIn search, however, doesn’t support wildcards. Entering marketing manager without quotes fetches all members who have “marketing,” “manager” or both in their profile. Limit the results to those that have the exact phrase with quotation marks. So “marketing manager” returns profiles with both words. In this example, someone with “software marketing manager” will show up, but someone with “marketing automation manager” will not. Many job titles and responsibilities use multiple definitions and terms. Web designers, for one, may use web design, web coder, web developer, PHP developer and so on. Clearly, web design has many titles, so refine your search by excluding a word or phrase from your search with upper-case NOT. Or if you want to cover them all, use upper-case OR. When you enter two or more search terms, LinkedIn displays profiles with all the terms whether as a phrase or a singleton. This is known as AND search, but you don’t need upper-case AND because it’s the default search type. Why tell you about this if you don’t need to do anything? Because it’ll come to play in the next type of search and combination searches. helpdesk OR “help desk” OR “technical support”: Search for profiles with any of these. web designer OR web coder OR web developer: Searches profiles with any of these three titles. web designer NOT web coder NOT web developer: Searches profiles for web designer, but not the other two titles. marketing NOT product: Searches profiles with marketing included but not product. Parenthetical searches allow you do to fancy searches by combining the other Boolean operators. Remember back in grade school, you calculated or grouped items in parenthesis separately? That’s how it works. Check out the examples. Now you can bring it all together to combine different types of searches. (tech support) AND “customer service”: Searches for profiles with terms tech and support and “customer service” as a phrase. Intranet (web designer OR web design): Searches for profiles with intranet web designer or intranet web design, but not necessarily as phrases. (User experience or UX) “information technology”: Searches for profiles with terms user and experience with the “information technology” phrase. In a perfect world, Boolean searches would do exactly as designed. Even with imperfect Boolean search results, they still provide sharper and more useful results than plain old keywords.